Broken links are bad for business. Let Dr. Link Check track them down for you. Non-working links are annoying and reflect poorly on your professionalism. They not only deter visitors from staying on and returning to your site, but they can also negatively impact your search engine rankings. Even worse than a broken link is a link to a website that causes harm through malware or phishing. 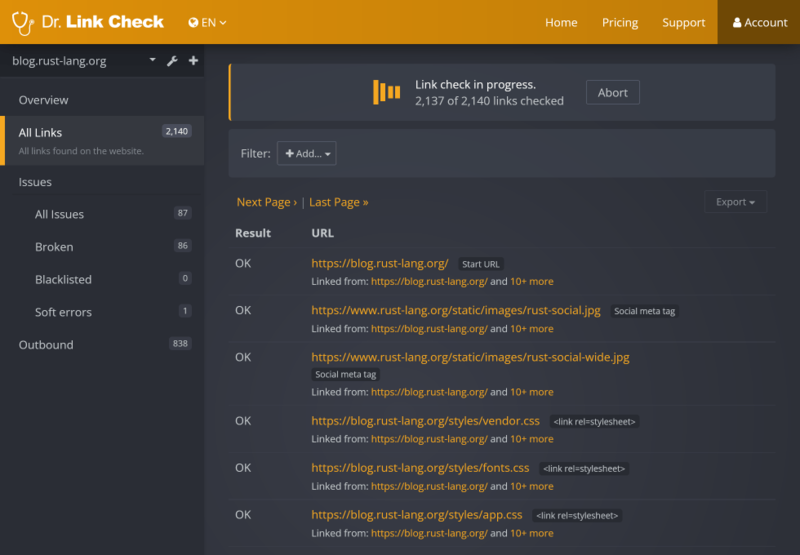 Instead of manually checking all the pages of your site and clicking through all the outgoing links, let Dr. Link Check do the work and give you a report of the links that need your attention. Beginning with a start URL, our bot crawls through the HTML and CSS code of your entire website and examines all the links it can find. This includes internal page links and outbound links to other websites, as well as links to images, style sheets, and other resource files. Each link found by Dr. Link Check passes through multiple checks to make sure you’re actually linking to the intended content. Broken link check: Is the URL properly formatted? Does the server respond in a reasonable amount of time? Is the SSL certificate valid? Does the return code indicate an error (such as 404 for a missing page or 500 for a server error)? Blacklist check: Does the link appear on any blacklists for hosting malicious content? Parked domain check: Is the link pointing to a placeholder site without any valuable content, typically one filled with nothing more than ads? 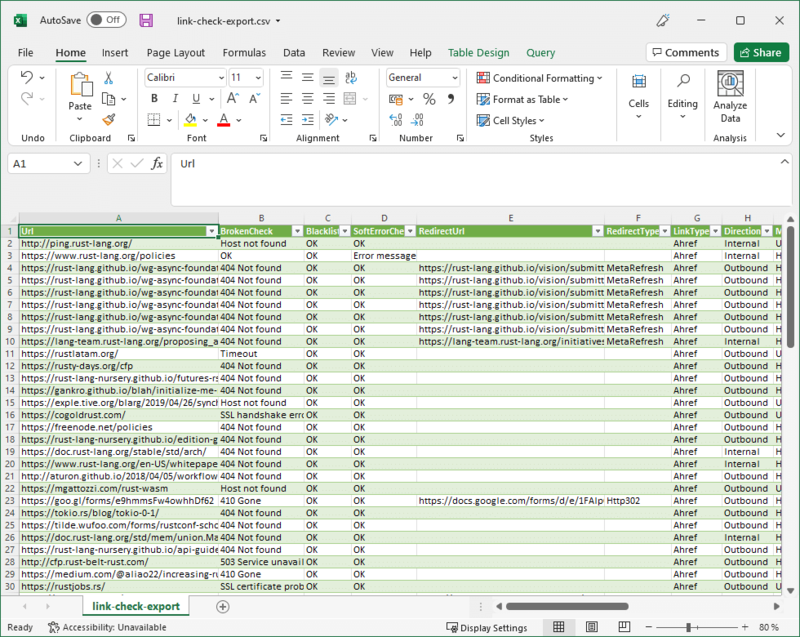 The results can also be sorted and filtered in various ways as well as exported to CSV for further processing in Microsoft Excel. You can configure your checks to run automatically on a monthly, weekly, or daily basis, and to receive status reports via email. 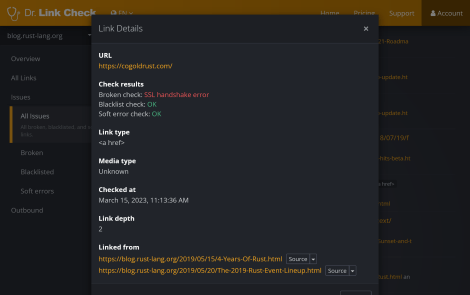 This way you can keep tabs on your site and detect link rot early, before your visitors do. 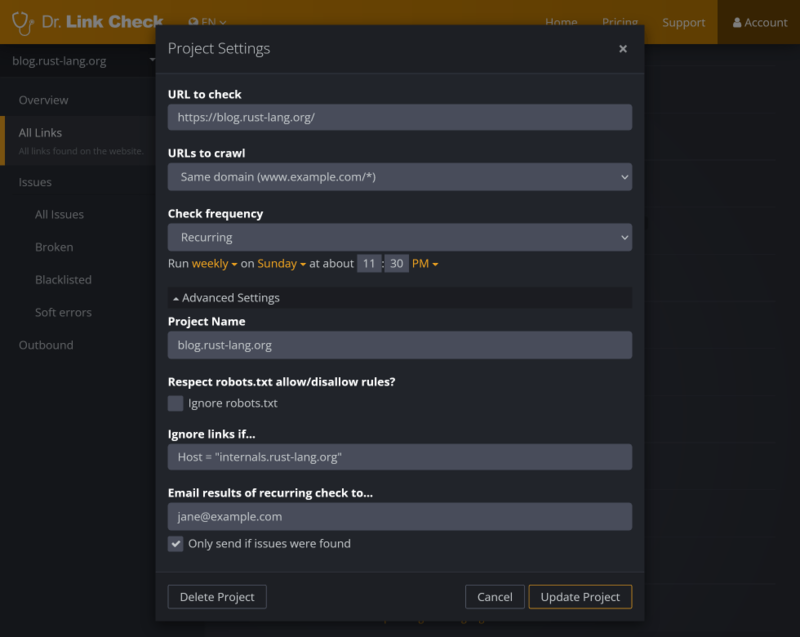 Dr. Link Check allows you to control various aspects of a link check. 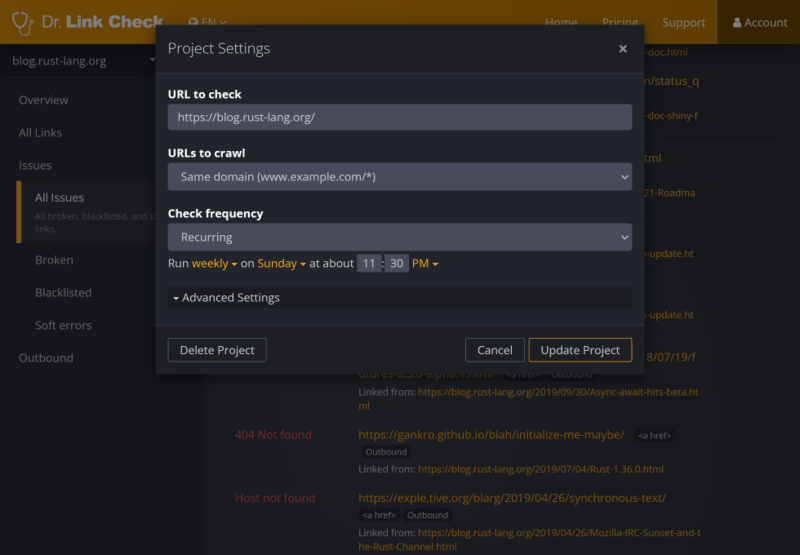 For instance, you can specify rules for which URLs to include or exclude from being checked, limit the crawl speed so as not to overwhelm your server, or specify recipients to email the results to.